The fun part of writing my latest book has begun – the second draft. It’s a bit like sculpting, looking at each paragraph, knocking out words that distract and inserting ones that enlighten. What’s really exciting is reading something that I had expressed poorly, and suddenly being able to fix it because I finally comprehend the idea’s deeper core. I am currently working on the pages that describe my first year of teaching (no computers yet), and I find that I ended that year with three convictions that kept me in the education profession and helped to carry me through the next 40 years. Teaching is important. If I had understood this during my early days in the classroom, I would not have allowed myself to get tripped up so easily. 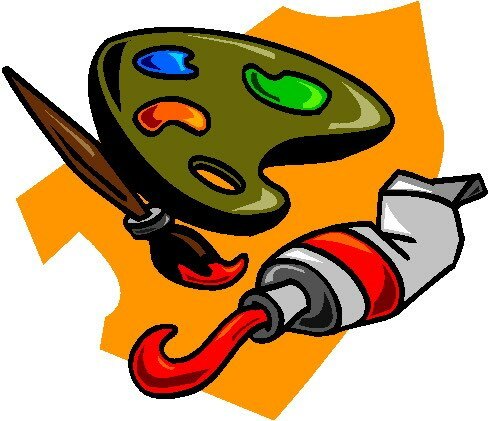 Teaching is a personal art. A classroom is not a laboratory and none of its subjects can be controlled. Even though there is much that is known about what works and what doesn’t, the most important tools for a successful teacher are imagination and inventiveness. Teaching requires a passion for both what and why you teach. To be imaginative and inventive in your classroom, you must already know a lot about your subject, be in the habitual practice of learning and unlearning, and understand why your students should know it. In 1993, while I was working at the North Carolina Department of Public Instruction and exploring the educational potentials of the, then emerging, Internet, I ran across an intriguing and inspiring summer project being conducted at Maricopa Community College in Phoenix, Arizona. With the local school district, they invited a diverse group of students who would be entering fourth, fifth or sixth grades (all at-risk of failure) into a MUD or Multi-User Domain. 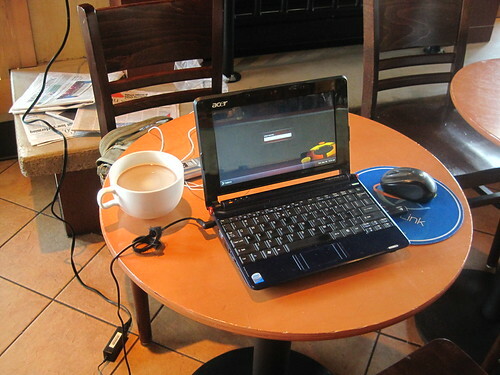 Essentially, a MUD is a text-based virtual environment. 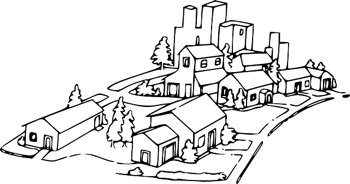 Think SecondLife where the environment is read about, instead of seen graphically. This particular MUD was empty, flat asphalt. These students, some of whom you couldn’t get to write their names in a classroom, were challenged to create a virtual city in the MUD, by learning a simple programming language and describing its buildings, parks and their own virtual homes, in all their richness, with words. You can read what Howard Rheingold had to say about the project here. At the end of the project, I invited a number of the organizers and volunteers to a virtual office I was maintaining at MIT’s MediaMOO, where my avatar was known as Peiohpah. There I interviewed the team about their experience. 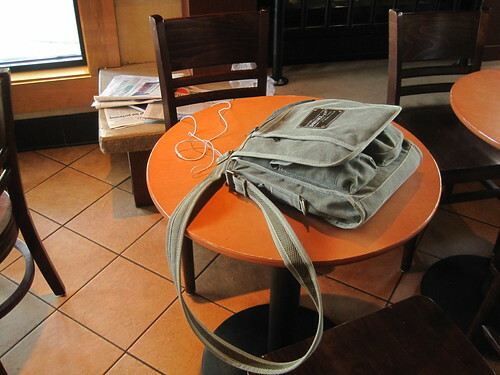 I had acquired a virtual video camera, which recorded the exchanges. Here is a portion of that interview played back on Pei’s TV. *New York Times* on an end table. [on Pei's TV]  Pei turns to the rest of the group. [on Pei's TV]  Miss-K says, "Hi, Pei"
at Phoenix college, a returning student"
first brought Muse to Phoenix College." disappears suddenly for parts unknown. librarian at Longview Elementary School. " [on Pei's TV]  Pei has arrived. [on Pei's TV]  Wlad materializes out of thin air. [on Pei's TV]  Pei says, "Hi Wlad!" [on Pei's TV]  Miss-K says, "Hi, Wlad"
[on Pei's TV]  Pei says, "Is that everyone?" Platoon will join us later"
[on Pei's TV]  Wlad says, "Thanks"
explaining how Camp MariMUSE came to be?" supportive of a technology linked proposal. So we set out to meet with her." didn't realize how big the tree would be. [on Pei's TV]  Lila says, "...and still growing!" the rabbit's hole with Alice." group we had access to." room school for learners of all ages." 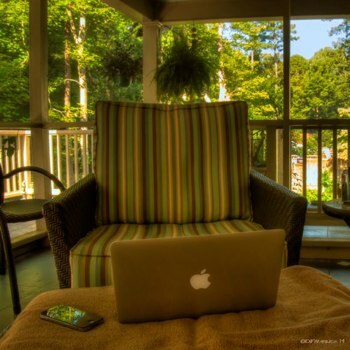 offer a class entirely in this environment." [on Pei's TV]  Pei turns to Miss-K.
[on Pei's TV]  Woody notices sweat on the brow of Miss-k.
[on Pei's TV]  Miss-K smiles sickly! [on Pei's TV]  Pei reaches over and touches Miss-K's hand! [on Pei's TV]  Pei's eyes widen with excitement. quite a lot of time in an amusement park." home of all the Longview campers." [on Pei's TV]  Pei says, “Yes!" with the children the most to talk. diverse the group really was. we thought might benefit the most. " college and work with the MUSE." [on Pei's TV]  Platoon materializes out of thin air. [on Pei's TV]  Platoon says, "HI Pei, sorry I interrupted"
[on Pei's TV]  Pei says, "Platoon, my man! gime five!" [on Pei's TV]  Miss-K nods. approach the text-based virtual environment? were to come back the second day." from you...they couldn't imagine that "
[on Pei's TV]  Lady Starlight materializes out of thin air. volunteer was really in California." a volunteer in the disk drive." drive slot trying to see Angus." for doing some creating in the MUSE." they were so unwilling to leave for break." too short of a day on the muse. [on Pei's TV]  Pei nods. I come back on line?" leave to go back to class." window to a new way of learning." school bus to be here." VERY proud of him and his accomplishments." and daily updates on the camp activities." felt like one big family celebration." believe we did all that in 3 weeks." [on Pei's TV]  Pei 's heart is full! [on Pei's TV]  Woody throws time out the door. [on Pei's TV]  Pei says, "Were there any real surprises?" [on Pei's TV]  Lady Starlight nods. research that the students initiated!" [on Pei's TV]  Avalon grins at Miss-K.
[on Pei's TV]  Avalon hands an embroidered hankie to Miss-K.
and can learn as we proceed into the future. to a very important project. [on Pei's TV]  Woody boogies about the future. get the kids back on-line." to do and so little time. [on Pei's TV]  Pei says, "Viewers...I am speechless!" In re-reading this interview I was struck by four ideas. The campers were engage in self-directed learning, because they were doing something with what they were learning. Their enthusiasm had nothing to do with slick graphics and booming sound effects. It was text. There seems to be a direct relationship between learner-engagement and parent-engagement. Young Learners need to see adults model meaningful learning. What if it happened before the Internet? One of the challenges of writing a history of educational technology is that so much of it happened before the Internet. I have been surprised and disappointed at how much of it, that I barely remember, has never been reported on the now ubiquitous World Wide Web. As a result, I’ve had to be resourceful in my research, and one of the tools that I’ve found myself going to again and again is Google’s Ngram viewer. Here’s the situation. I’m writing about happenings just after I left the NC Department of Public Instruction and discovering that my future is going to be in training and presenting, instead of Web design and development. 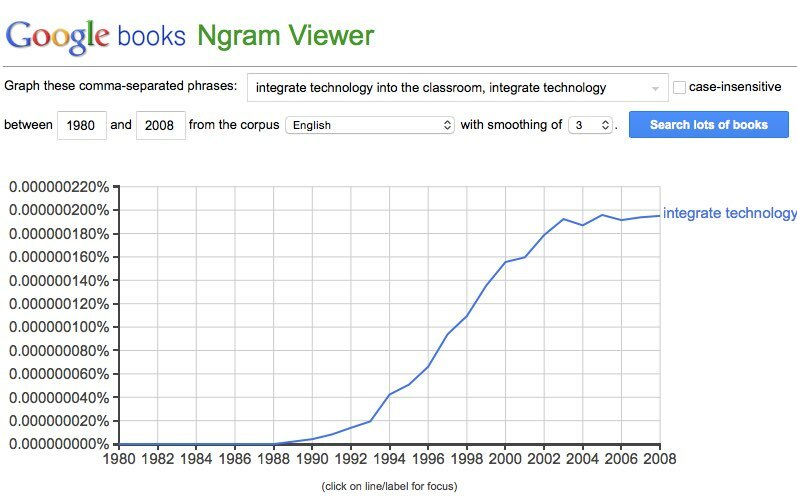 I believe that it was during this time when the term “Integrate technology’ was being adopted by ed tech advocates. But I’m not sure. How do I determine, on a timeline, the growing use and abuse of the term. 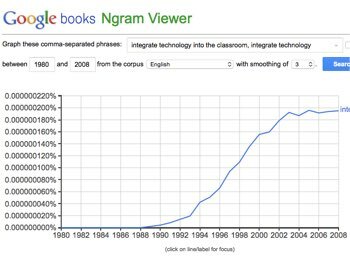 Enter Ngram Viewer. The default terms are Albert Einstein, Sherlock Holmes and Frankenstein. The viewer presents a line chart, illustrating the number of Google digitized books that mention the term by year, from 1500 to 2008. The default shows the gradual growth of Frankenstein from just after the publishing of Mary Shelley’s book (1818), and then a more rapid rise of Sherlock Holmes starting in the final years of the 19th century. Occurrences of Albert Einstein started in the second quarter of the 20th century and then Frankenstein, again, overtakes and surges well above, starting in the 1960s – possibly as a result of television’s re-running of Frankenstein movies released in the 1930s and ‘40s. Author David WarlickPosted on December 9, 2014 December 9, 2014 Categories data sources, Data Visualizations, education, IGAD, infographic-a-day, information, learning, learning-literacy, literacy, shakabuku, technologyTags education, Google, Ngram, Ngrame Viewer, research, writing1 Comment on What if it happened before the Internet? I Can’t Believe I’m Doing this Again! In our 35 years of marriage, there have been only a few instances when my wife realized what a cleaver fellow I am – maybe three. I think one occurred yesterday. As you may be aware, I am winding down my career as an educator. My wife, concerned about identity security, has spent parts of the last couple of days looking for my social security number included in two large file cabinets of documents from 19 years of clients and jobs. She commented, as we were walking up to North Hills yesterday, that I had accomplished a lot in my years as an independent and been part of some pretty exciting developments in education and technology. Yet, this morning, as I woke and lay in bed, my mind was going like it hasn’t in many months, seeming to have realized that in some deep and evil corner of my brain, the decision has been made. I had an outline written out by 8:30 this morning – for a new book about the history of educational technology. I really can’t believe that I’m Doing this Again! Author David WarlickPosted on July 23, 2014 July 23, 2014 Categories DANCEBOOK, education, information, leading, learning, learning-literacy, literacy, shakabuku, teaching, technologyTags author, books, DANCEBook, education, learning, teaching, technology, writing3 Comments on I Can’t Believe I’m Doing this Again! Evaluating Information: The Wrong Way or the Best Way! A couple of weeks ago, I delivered several presentations to a school district in the mid-west, one of the numerous August back-to-school gigs I’m doing fewer of each year. It was a rewarding day, more so than many. Keeping the attention of hundreds of teachers, just back from vacation, catching up with friends, weighing in the politics of new leadership, and desperately needing to be in their classrooms makes this a pretty tough gig. Not so on this day. If I was still teaching history, and my students turned in a paper, they would be waiting for the challenge. It happens every time. It’s part of the ongoing classroom conversation. Placing a student’s paper on his desk and pointing to one paragraph, I ask, “How do you know that’s true?” If the student can’t answer the question, he’s going to lose points. Even if the paragraph is true, he’s going to lose points. My students would be responsible for their information’s appropriateness and the evidence that supports its appropriateness. Our position, as teachers, is based on this assumption. For the problems caused by the Internet, we create checklists to identify the breakage in information. [ ] Is the author’s name included in the page & can he be contacted? [ ] Are the author’s qualifications available? [ ] Is the publisher an educational institution or other reputable organization? [ ] Is the information fact or opinion? Is there bias? [ ] Is the URL domain among the trusted (edu, gov, org)? If you can check all of the above, then you can use the information. ..but not as a practice in solving them. If we teach our learners to research and communicate in order to solve a problem, then we entirely change the approach. We assess their work through conversations about the “best way” rather than the “wrong way,” and learners become active defenders rather than passive accepters of judgement. The classroom conversation changes. Students become more active, empowered and invested. They become stakeholders in their learning, and ultimately, responsible to an authentic context/audience. They own what they write, present or make, because they did the work and defended it. They’re accountable. 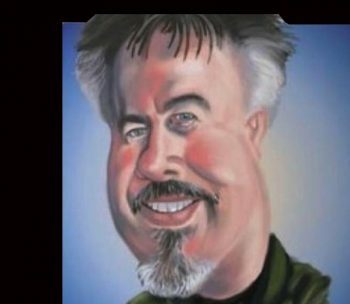 Author David WarlickPosted on September 7, 2013 September 7, 2013 Categories education, information, literacy, shakabukuTags education, internet, learning-literacy, literacy, research, writing3 Comments on Evaluating Information: The Wrong Way or the Best Way! It’s one of those ideas that has occurred to me during those moments when a perfect example presents itself, but then loses itself in the stack of other ideas of similar birth and death. But here, at the beginning of the school year (at least in the Northern Hemisphere), it seems like a good time to suggest Blog Worthy Topics. I’m thinking specifically of learner blogs, classrooms where both teacher-learner and student-learner are blogging, and sometimes looking for topics for writing, sharing, and engaging about. So I want to suggest a Twitter hash tag, #bwtopic. I just did a search of bwtopic in Twitter and it appears to be a unique string.. So, as you encounter a newspaper or magazine article, blog post, speech, YouTube or TED video, or whatever, that seems like an appetizing topic for learners to explore and build on, then Tweet it with the hash tag #bwtopic. We can follow the suggestions via RSS. Here is the feed (Atom) for a Twitter search for #bwtopic. 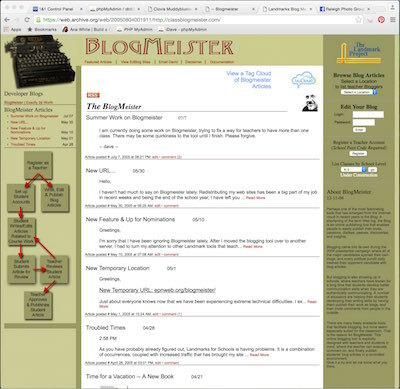 I’ll be posting this feed on the Class Blogmeister Ning network, so that teachers there will have ready access to the latest topics. Tim Holt recently wrote an interesting entry (Do I Trust the System Enough) in his blog, Intended Consequences. In it, Tim describes his plans to write a book for administrators about a particular type of professional development. He is planning to follow my example of self-publishing the book, hopeful that “..enough people purchase it so that (he) can put (his) kids through college.” My experience with self-publishing has been almost entirely positive and fruitful. I’ll never make a living at it, and I’m still working on my son’s tuition, but writing for yourself is a true pleasure. I talk a lot about collaborative work. I talk a lot about sharing. I talk a lot about using professional networks to enhance learning and your professional work. So here is a perfect example of something that I can put “out there” for my PLN to critique, add to, subtract from, tell me I am full of it, or give me a pat on the back. I want folks to work with me through the process, to share, to be part of the product. Everyone would get credit. There are a number of notable examples of books written publicly on wikis or in similar environments. I’m not absolutely sure, but it seems that one or more of Lawrence Lessig’s books were written publicly, as was Chris Anderson’s The Long Tail, through his blog. ..I just hesitate putting it out there because I keep thinking that it is going to be ripped-off before it is done and someone will take my idea and run with it. I’ll say here that I have been working on a short (hopefully) book about networked professional development for a little over a week now, trying to take advantage of an almost three week stint with no traveling. I explained a little more about the project in my comment on Tim’s blog. But that asside, I also tell a story where several years ago someone (I do not recall who) sent me a package with a note asking if I was aware of this. The note indicated the page number, in a paperback book enclosed in the packaging, for a chapter which was, word for word, an article I had written a few years earlier and published through a now defunct online journal. I was furious and immediately shot off an e-mail to the publishers, who were in India. There was never a reply to that e-mail. I quickly settled down, realizing that there was nothing I could do that would be worth the expense, and I forgot about the whole episode until now. Things are different now, aren’t they? India is not nearly so far away. I would probably have no more success with the publishers. But today, I have a blog. And many of the readers of my blog have their own blogs. And we could fill the edu-blogosphere with our indignation about an instructional technology book that so blatantly plagiarizes the work of another. I think that Tim has a valid concern. He is talking about investing a lot of work into a project — A LOT OF WORK, and he has a right to be concerned about the property that will result. But our community is so much more transparent today that if I were considering writing my book publicly, fear of theft probably wouldn’t stop me. 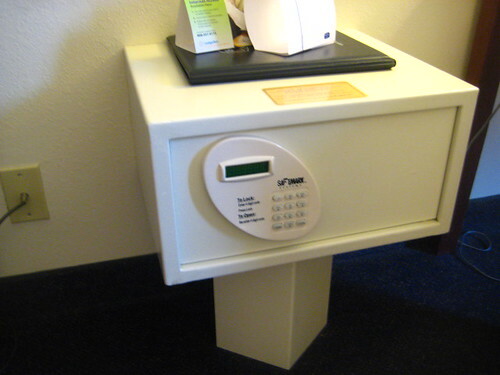 You can tell when your hotel is in the shadier part of town when the safe is sitting right out in your room. So many blog articles in the hopper, and so little time. I’m sitting in a hotel near the Philadelphia Airport, from where I’ll fly to Toronto later today. But I’m hold up here working on an article that I’d thought was finished. It’s always the case, you agree to write an article. It seems like a no-brainer, you write it up, send it in, and it comes back to haunt you. “Would you expand on this?” “More detail here?” “We’d love it if you could add this idea?” I’m not really complaining, because it always — ALWAYS — makes it a better article. ..and deadlines are loom like a — well I’m currently reading a book about the French Revolution, so you can imagine my imagery!